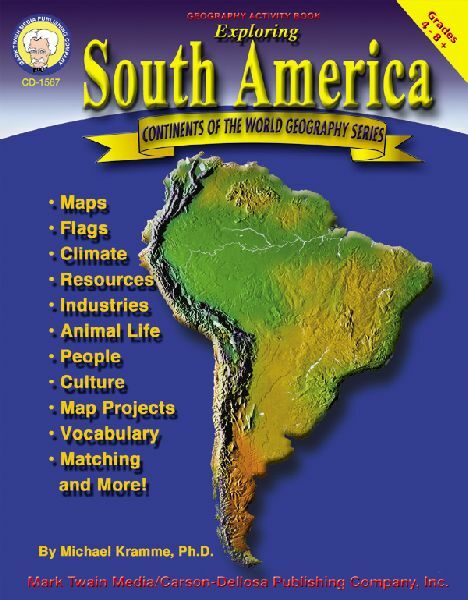 TheReadingWarehouse.com:Exploring South America, Grades 4 - 8:Michael Kramme, Ph.D.
Annotation: Students will love exploring South America in this comprehensive, supplementary resource. Activity information covers maps, climates, resources, industries, people, animal life, cultures, and more! Information is presented through questions, map labeling, research, and writing so that students become engaged learners. It also includes bibliographies and answer keys. --Mark Twain Media Publishing Company specializes in providing captivating, supplemental books and decorative resources to complement middle- and upper-grade classrooms. Designed by leading educators, the product line covers a range of subjects including mathematics, sciences, language arts, social studies, history, government, fine arts, and character. Mark Twain Media also provides innovative classroom solutions for bulletin boards and interactive whiteboards. Since 1977, Mark Twain Media has remained a reliable source for a wide variety of engaging classroom resources.